Graydon Hall Manor has some beautiful characteristics. One of them is the view of the house from the courtyard. I simply love the symmetry. I asked my couple to stand nose-to-nose on the balcony. I called Oliver on the phone, who was with the couple, so that I could relay any posing direction to them. 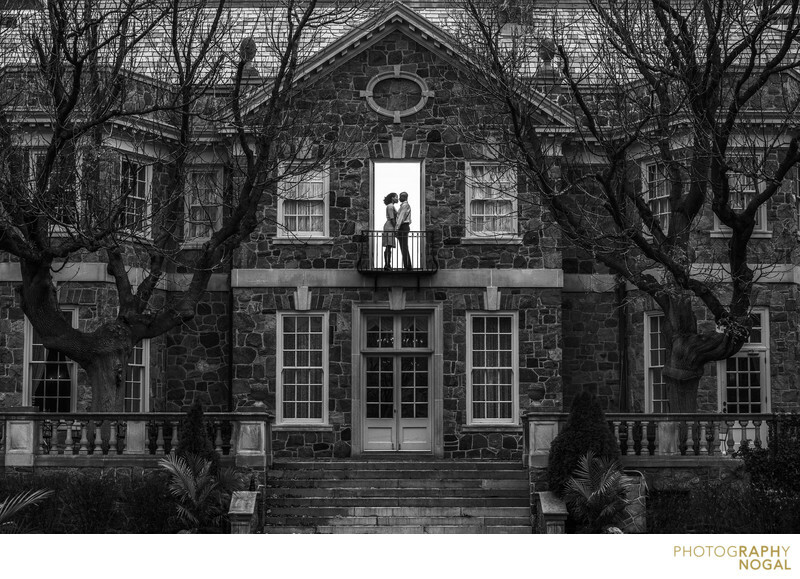 The result was a beautiful image and not only that, this image won a Wedding and Portrait Photographers International (WPPI) Silver Award in the Engagement category. This image was taken with the Nikon D750 at 1/250th shutter, aperture f8, ISO 500 with a 70-200mm f2.8 VR2 Nikkor Lens at 70mm focal length. Lighting was created by a single speed light into the MagMod MagSphere which lit up the entire room behind the couple.